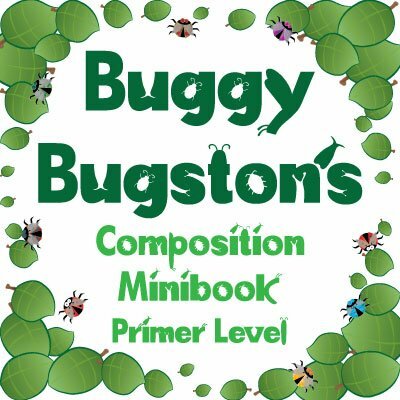 ‘Bugston’s Adventure’ is a music composition minibook for Primer level (beginning) music students. This book is a great composing supplement for use in private instrumental lessons or group classes. On completion of this book the student will have composed five songs that follow Bugston’s adventures. Each song consists of four pages, the first focuses on applying rhythm to the lyrics, the second composing a melody using letter names, and, the third and fourth to write out the composition on the grand staff. The rhythm section of each song gets progressively more difficult, with the first rhythm provided completed, and every rhythm after requiring a little more of the student. The student is required to use a specific five finger scale for each piece, all white key only scales: C major, G major, D minor and A minor. This does require a reasonably wide range of notes on the grand staff, some of which the student may not have encountered yet, but there are reminders of the notes needed on the grand staff pages to help with this. 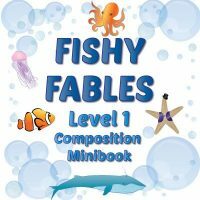 This minibook is intended for ages 6 – 10. Younger students will require more help from the teacher, but older students should be able to complete the pages at home. If you purchase the single user license, you may only print one copy of the file. If you purchase the studio license, you may print as many copies as you like, as long as it is for use only with your own students.